Yozuru is a lady with black hair and red pupils. Her hair, which is styled in a bob cut, has red streaks on it, and is adorned with a bird-shaped hair clip. She is dressed in a khaki shirt worn over a black collared top, the latter of which is also decorated with the same bird design as in her hair clip, and wears a pair of dark red pants held in place by suspenders. Her footwear of choice is a pair of black high-heeled sandals. 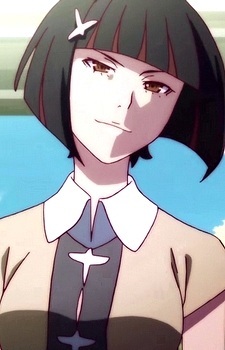 She is a professional onmyouji and belongs to the same university that Deishuu Kaiki and Meme Oshino studied in and the three are known to be constantly together as members of the university's occult research club. Among the three, she is the one who prefers to stand for justice. Between those three university students, she was the only one who graduated. Yozuru is a rather famous figure in the realm of the supernatural, to the point that Shinobu Oshino, herself a very powerful oddity, refused to divulge any information about her as a form of respect. She speaks in a Kyoto dialect, and is described as having the expertise in the dialect as a native speaker. She also has an unusual quirk of avoiding to step on the ground, as if playing a game where the ground is a sea filled with sharks. She maintains this quirk at all times, and would even use her familiar Yotsugi Ononoki as a platform of sorts if needed. It was revealed that as an exchange for her immense strength, she was given a condition to never step on the earth. She fights by using her fists and is powerful enough to punch through multiple floors at once. Unlike Meme, Deishu, and Gaen, she works for free which means that she only hunts and kills oddities because that is what she truly wanted. Yozuru calls herself "Japan's first battle onmyouji." She is sadistic and brutal and chose to specialize in exorcising immortal beings because nothing else is a challenge for her. Although she considers herself as an ally of justice, her ideology is based on exacting justice by eliminating those who should not exist (immortal oddities) and disregarding the consequences and doing such an act. To her, immortal oddities have no place in the world. Despite this, however, she has a considerate side as well, seeing people like Koyomi as a human despite having contact with an oddity. According to Koyomi himself, Yozuru reminds him of Meme somewhat. Yozuru uses her judgement on which immortal kais to fight and hunt by separating them into what is alive forever and what is dead forever. She then hunts kai that are considered alive forever and that's why Yotsugi is her assistant as Yotsugi is technically not alive. While Koyomi was fighting her, he counted how many times she punched him while breaking through the floors,—he counted almost 500.